This week, Makeup Wars is all about skin care and I've decided to share with you my fall/winter cleansing routine for very dry skin. 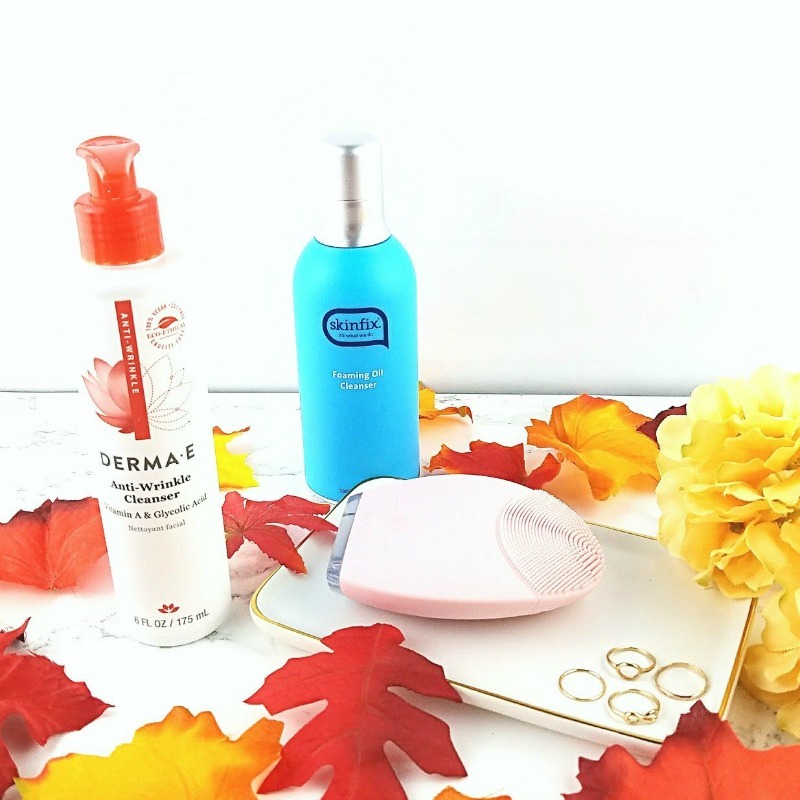 Fall is officially here and with cooling temps and plummeting humidity comes a shift in the way I cleanse my skin. I can't get away with a quick wash in the shower and slap on some serum and moisturizer, like I can, in the summer. Take it Off! Take it ALL Off! My makeup, that is. If I'm wearing makeup that day, double cleansing is mandatory. Nothing else takes it all off like two steps; the first removes as much of the old, stale makeup from my face as possible, the next deep cleans and conditions my skin, leaving it feeling clean and soft. The first thing I do is grab is a Shiseido Facial Cotton square and I soak it with a little Lancome Bi-Facil Double-Action Eye Makeup Remover, and press it to my eye, letting it sit there for a few seconds to soften and break down my eye shadow, liner and mascara so that I can gently sweep it away without rubbing and scrubbing to leave my eye area perfectly clean, without a hint of leftover mascara or liner. I adore that this remover never irritates my very sensitive eyes or leaves them feeling slimy or filmy. I don't know about you, but at the end of a long day, I want nothing more than to get the makeup off of my face and a nice, soft Neutrogena Makeup Remover Cleansing Towelette or some Bioderma micellar water on a cotton square does the trick. And the next part of a good double cleanse for me is a nice, rich cleansing balm or oil. Cleansing balms melt away left over makeup, dirt, oil and pollution and rinse away to leave my skin feeling soft and clean. 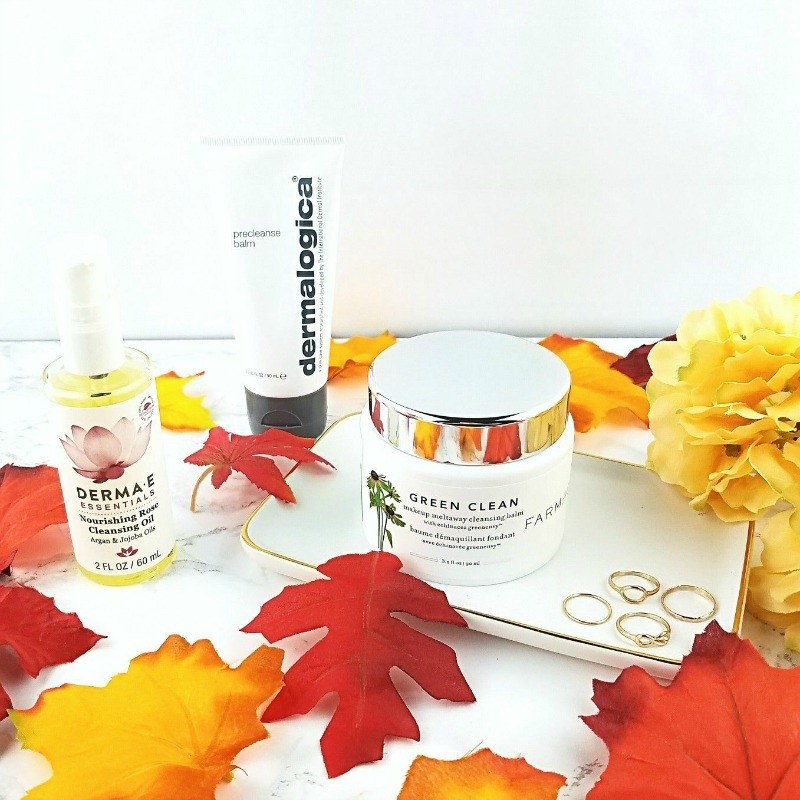 I have a small pile of cleansing balms in my skin care hoard arsenal and Farmacy Green Clean Makeup Meltaway Cleansing Balm and Dermalogica Precleanse Balm are a couple of my favorites. Cleansing balms are so easy to use; just smooth a generous dollop into the skin, add a little water and it turns into a light, creamy cleanser that lifts the day and sweeps it away as I rinse my face. A nice cleansing oil, like Derma E Nourishing Rose Cleansing Oil has a soft, rose scent and a light feel that none the less cleanses thoroughly and rinses clean. If I'm not wearing makeup, I usually just grab a facial cleanser and get the job done, lickety-split. I like cleansers that get my skin sparkling clean but won't dry it all out, leaving it feeling stripped and tight. Skinfix Foaming Oil Cleanser forms a soft, cushioning lather then rinses clean. I really like this cleanser for shaving. Yes, gentle reader, I routinely shave my face. Shaving ever so gently derma planes my skin, removing all of that obnoxious blonde peach fuzz that I don't like and it exfoliates, so that my skin feels smoother and I think, looks a little younger, too. My current in the shower cleanser is the Derma E Anti Wrinkle Cleanser. It contains Vitamin A and Glycolic Acid delivered via a light, refreshing suds to give my skin a little extra treatment as I am cleansing. I can't talk about facial cleansers without hyping my favorite skin cleansing device of life. The Foreo LUNA for Sensitive/Normal Skin is a device that delivers ultrasonic pulse waves through tiny silicone fingers to stimulate and massage my skin as it deep cleans. This little skin care wonder runs forever and I do mean forever on a charge. Since I got my LUNA, I've only charged it a few times. I love, love my LUNA. I have the original model, it still works perfectly and I haven't felt the need to pick up the newer one. Bonus to picking up the original? It's a good thirty dollars less than the LUNA2. Exfoliation not only powers off the dead, dry skin cells that can make my skin look and feel rough and patchy, it lets my skin soak up all of the good, active ingredients in my skin care so that it gets the maximum benefit. I have so many scrubs and treatments and a couple of amazing peels but there are two exfoliators I have been reaching for most often, lately. Derma E Microdermabrasion Scrub combines Dead Sea salt and citrus oils in a lightly hydrating base to polish away dead, dry skin. 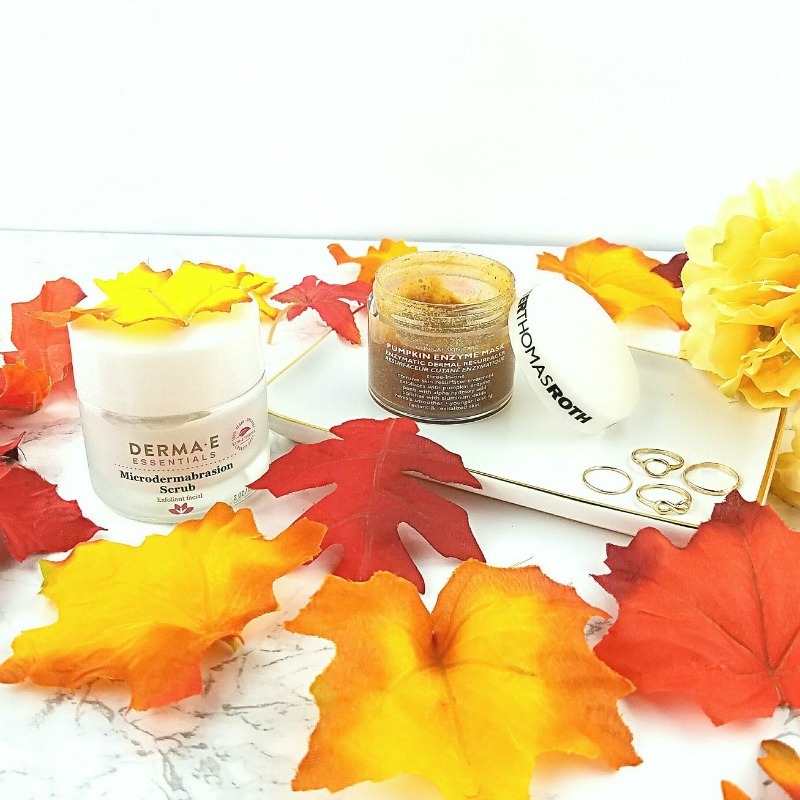 Peter Thomas Roth Pumpkin Enzyme Mask Enzymatic Dermal Resurfacer is an intensive treatment that combines pumpkin enzyme, Alpha Hydroxy Acid and aluminum oxide crystals to give my complexion the ultimate spa style treatment. Plus, it smells like pumpkin spice. Both of these treatments give me a super soft, glass smooth and glowing complexion. So, there you have it. 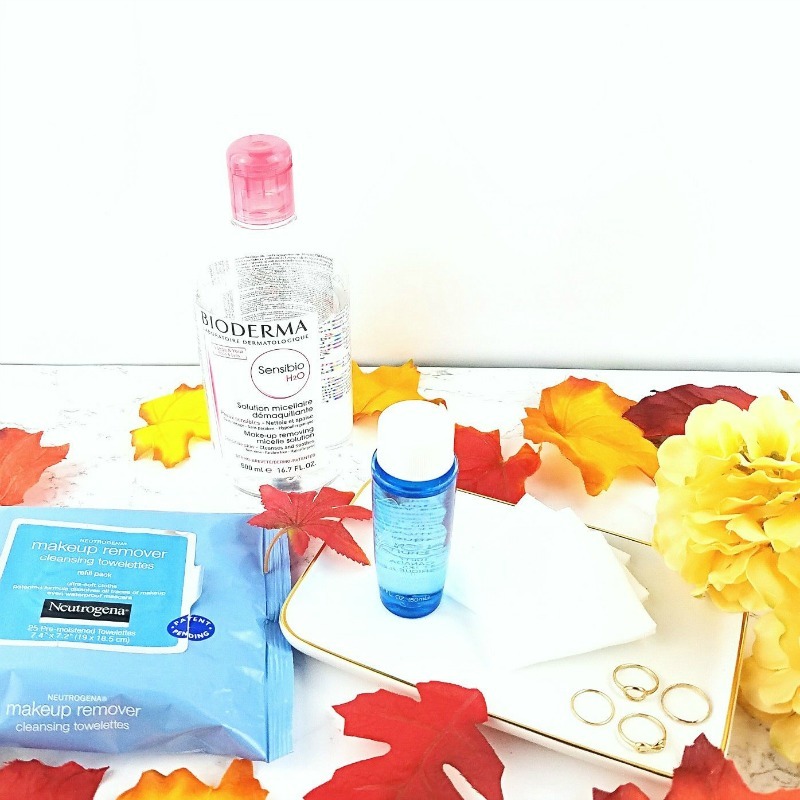 My fall/winter skin cleansing routine for my very dry skin. Do you change your routine with the seasons? What are some of your favorite products? Please do tell, in a comment, below. This is a Makeup Wars Collaboration Post. 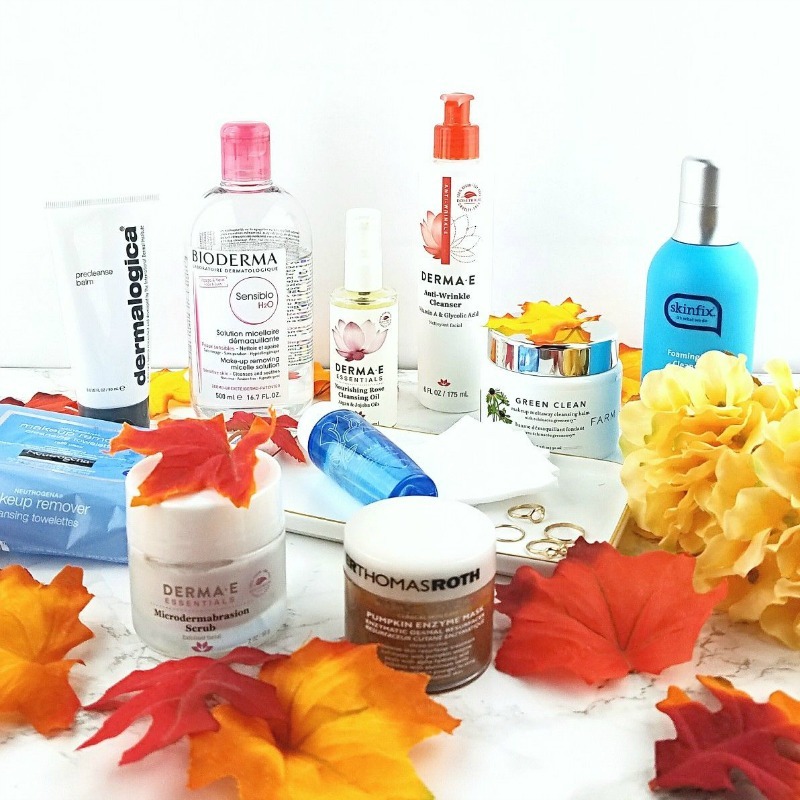 Be sure to scroll to the end and click the gallery links so that you can see what skin care products my fellow Makeup Wars bloggers are loving, this fall. You have some great picks for dry skin! What wonderful picks! I have a lot of those Derma E products, the Bioderma Sensibio and the Lancome makeup remover, and LOVE all of them! I need that cleansing balm from Farmacy! You must try the Green Clean! It's lovely stuff. A little spendy but worth the ask, in my opinion. Great choices. I'm impressed. I usually use one line at a time but when I'm in between testing then I pull out some favorites. I've got to find out if Luna sells separates cords since mine went missing when I moved.